Our technical specifications are essential to ensure the optimal quality of your vinyl record. Make sure to respect them during the ordering process. A tracklist with the titles of the songs and their lengths for our cutting engineer is also necessary.  Pay attention to send us the files in a .rar or .zip file, with the reference you want to see engraved at the center of the record (eg: 33rpm VRM02-2018). For a 12″ album, the ideal length is 20 minutes max per side. For a Maxi 12” ep, the ideal length is 8 minutes max per side. Please send us your files in a 300dpi resolution PDF, take good care to remove the templates on your final files. Every special treatment (Embossing, Partial Varnish UV, Foil ) must be sent separately in a proper file. Labels files must be sent separately. Our technical specifications are essential to ensure the optimal quality of your discs.